“Wascally Wabbit!” The infamous words of Elmer Fudd who wanted to eat Bugs Bunny so badly, he did anything and everything he could possibly do. I still remember the one episode that Bugs Bunny felt so bad that he ended up dinning with Elmer Fudd. Ahhh…the childhood memories of Saturday morning cartoons. Well, today, we are going to eat rabbit! The bad news is I have to eat frozen rabbit, as there is no way to get fresh rabbit in the city unless I go to the pet store and pay effectively $30 for a little bunny. The rabbit I was able to find was at a large Chinese grocery store. They had a few in the frozen section. It was just wrapped in cellophane and was about $5 a pound. Kind of expensive if you ask me, but it’s such a novelty, as there isn’t many places to find rabbit already butchered. I let it thaw overnight and the meat stayed pretty much in the same shape as they wrapped it, which looks like the picture above. I split it down the middle, so I can have one side cooked one way and the other side cooked in a stew. Elmer Fudd really wanted some rabbit stew, so I’m going to do it the same way. The meat looks like chicken, and is a white meat, but it’s much leaner than chicken. There isn’t a strong smell, but that’s not a fair assessment as I didn’t get it fresh. 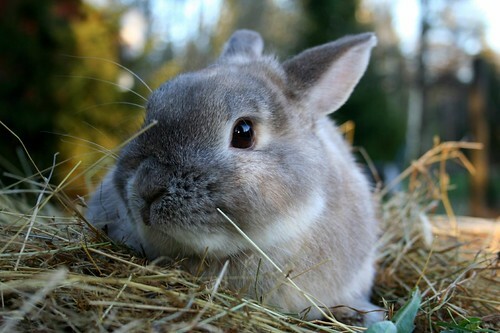 I was told the wild rabbits, have a much gamier smell and woodsy taste, just like any wild animal. I could eat chicken from the store, or eat wild pheasants and it’s a very noticeable difference. *sigh* growing up and living in the city does have it’s downsides. The first half of the rabbit, I just cooked it on the BBQ grill on low heat. Put some oil on it, sprinkled some salt and pepper when it was cooking and that’s it. I wanted to preserve the taste of rabbit in it’s most natural form. The reason I cooked it on the grill is to kind of mimic all the movies where you see the guy catching a rabbit then cooking over his campfire. It’s cooked at it’s most basic form. The rabbit I got must be farm raised rabbits. Not sure if they could sell wild rabbits in the stores. There isn’t much of a wild gamey flavor. The texture is soft and also a little stringy. It’s like chicken and turkey thighs. I’m trying to ignore the BBQ grill taste, and it’s very much like chicken, but there is a sweetness to it. The other half of the rabbit, I just made a stew, like how you would make chicken soup, but thicker. I tried not to overpower the flavors with too much herbs and spices. Maybe that’s where I went wrong, and should’ve made it thinner like a chicken noodle soup. I honestly couldn’t tell if I was eating just regular chicken at $0.99 cents a pound or rabbit at $5 a pound as far as taste is concerned. The only thing to give it away was the chopped pieces of rabbit, and how you had to work a little bit more to get it off the meat. 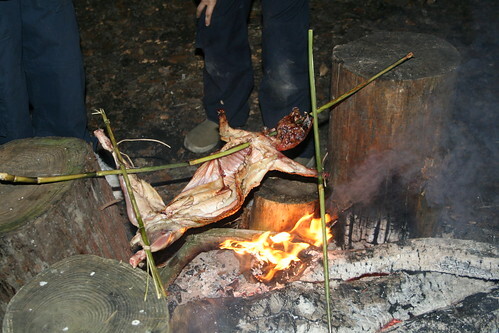 Next time, I’m just going to set up a campfire when I go camping, pull out my frozen rabbit, and try to get the full effect of cooking it over an open fire for the full city slicker in the woods effect. I’m sure it will be so good and flavorful! This entry was posted in bbq, food, outdoors and tagged bugs bunny, bunny rabbit, eatting rabbit, elmer fudd, how to cook rabbit, how to eat rabbit, rabbit grill, rabbit meat, rabbit stew. Bookmark the permalink.